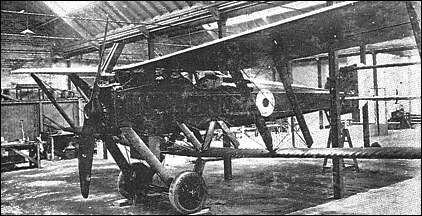 Parnall and Sons of Bristol initiated work on the company's first original aircraft, a single-seat anti-airship fighter to the designs of A Camden Pratt, in 1916. Intended to meet a requirement formulated by the Admiralty, this aircraft, unofficially known as the Zeppelin Chaser, was a large, two-bay staggered biplane of wooden construction. It was powered by a 260hp Sunbeam Maori 12-cylinder water-cooled engine and armed with a single 7.7mm gun offset to starboard and firing upward at an angle of 45�. Two prototypes were ordered, but the first of these proved appreciably overweight. Although the Scout reportedly flew twice, it was considered to possess unacceptably low safety factors and was returned to the manufacturer, development being abandoned.